This was a smart girl; she thought ahead for her prom dress. She came to me way back in November with her dress ideas. That gave us plenty of time to fabric shop, make a muslin and get it completed for her without feeling rushed! Her original design was a little different than the finished product, if only because we had to change one little thing. 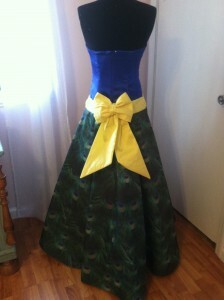 She had invisioned the skirt of her dress covered in real peacock feathers. Gorgeous, right? Gorgeous price, too! Even buying in bulk, the feathers would have been more than she had anticipated. Then there would be the cost of sewing them all on the base fabric. Cha- chung!! After going over those little cost details, I suggested we look at www.spoonflower.com. Immediately we found the perfect fabric. I ordered 5 yards of silk/cotton. When it arrived, it was just like Christmas! This fabric is so very pretty! The perfct sheen, the perfect drape! 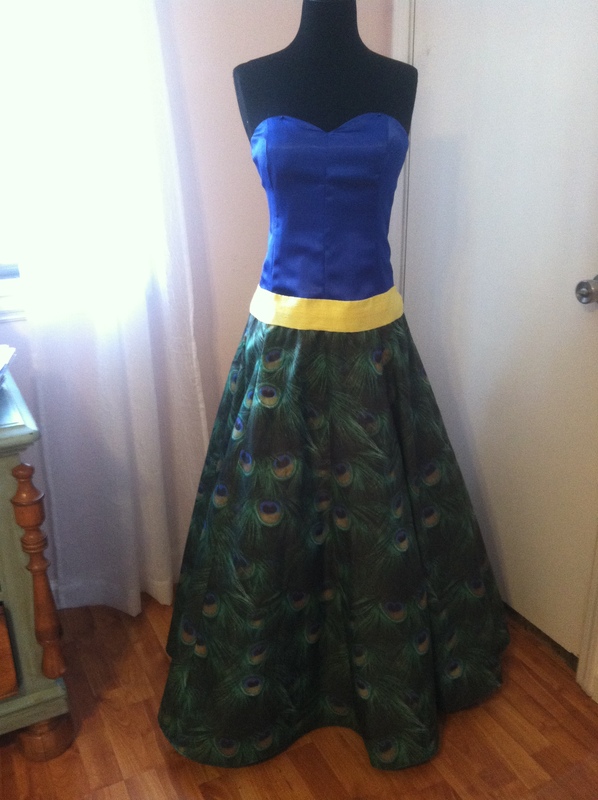 I finished the dress just yesterday – ready for pick-up this weekend! The bodice is a bright Marine Blue satin, and the hip level sash is a bright yellow silk doupioni. The bow at the back is removable (attached with clear snaps). The bodice fits closely through the hip, then flares out into a full skirt, shaped with crinoline netting. 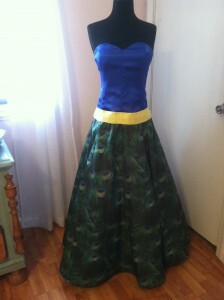 So pretty for a prom dress!